Venue: West Cork Arts Centre. Project Manager: Ann Davoren Director of the West Cork Arts Centre, Ines Amado Director of the 'Bread Matters' research group. 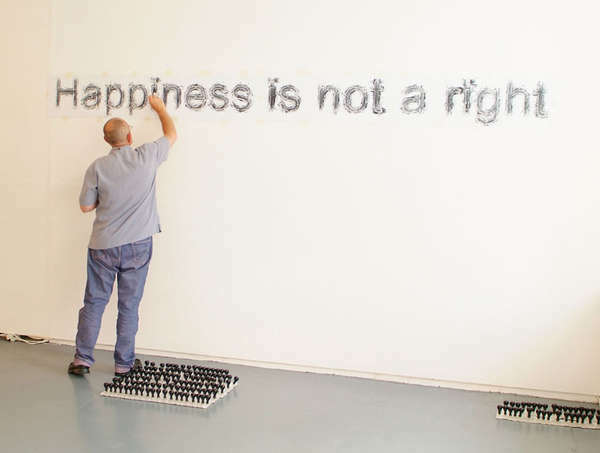 The performance-action involved placing a stencil of 'Happiness is not a right' onto the wall. The inking was done using 147 rubber stamps. Each stamp carried a short text. The text for the stamps was generated from all the questions that were found in hymns from the Methodist Hymn Book of the early nineteen eighties. The action lasted nine hours. Each of the 147 stamps was used on each letter of the stencil. During that time the individual texts on the stamps became lost in the build up of solid blocks of ink. The stencil was removed and the stamps were placed in front of the text on the wall.